Hi everyone! By now, I think we are all getting fully adjusted to our classrooms and are really in the swing of things for the new year. I know some of you are getting ready to finish out your first nine weeks while others are just three weeks in (like me) and finally getting a good handle on your kids. Right now, we're working hard to get our classes immersed in Daily 5 and CAFE. 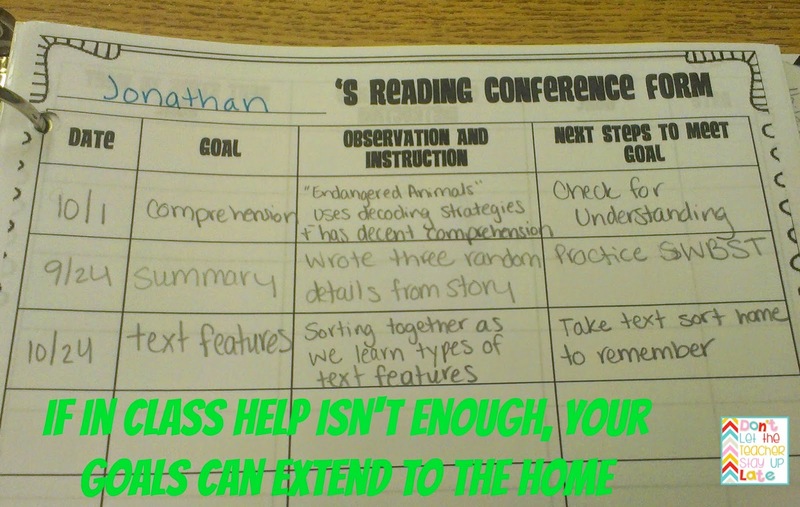 The lessons have begun, and this is the point where teachers really start pushing to get in those individual reading conferences. 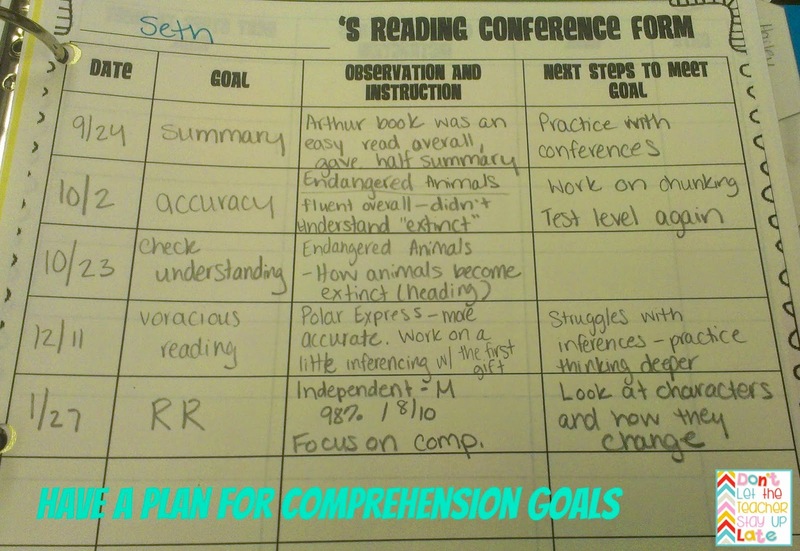 One of the issues that I notice many teachers struggle with on these conferences is setting goals. I keep my form simple (you can click on the cover to the left to download for your own use), but writing useful goals takes a lot of time and practice. I pulled out my forms from the beginning of last year to look at and give some examples. You can see how some are a little weak and leave a lot wide open without a clear path. The more specific you are with the goals, the better your student will understand how to improve. I'm going to give a few examples from my own forms and talk about what works and what might not. I hope these help! 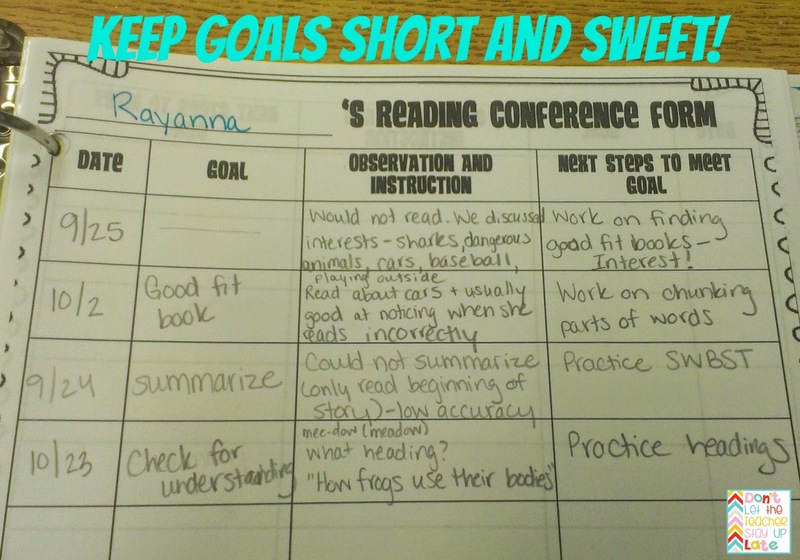 These are some goals that aren't terrible, but they really don't do much for the student. 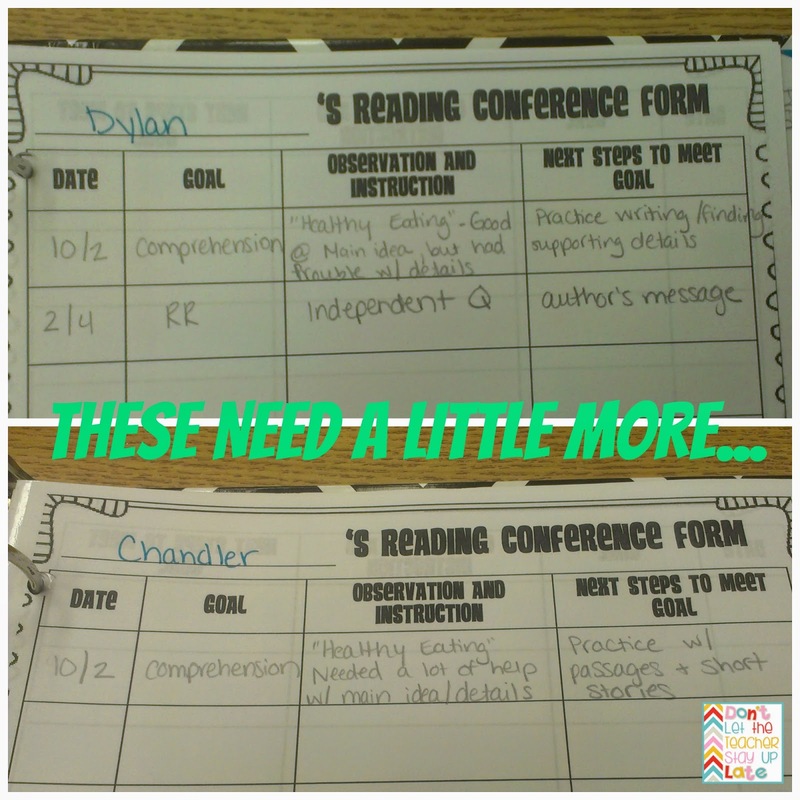 Yes, as a seasoned teacher, I know what I mean when I write "author's message" or "practice with passages", but these goals are supposed to be something that the student can work on independently as well. I would have been better to put these on a sticky note (or maybe in the observation section) and then come up with a plan for them to work on at their seat that was more specific. This one starts off weak (and then I think I just kept his goal for the middle and didn't bother to write anything), but notice how the goals get more specific. On the last one, I didn't even list the specific skill. I gave him a task to focus on while reading to self. Finally, sometimes you may have to assign "homework" to help. I had one student who just couldn't get the hang of text features. We did an activity in class (this actually was a small group lesson, not individual conferences), and I noticed he was WAY off. I jotted this little note with the date and then let him know that I wanted him to practice them at home for the next time. 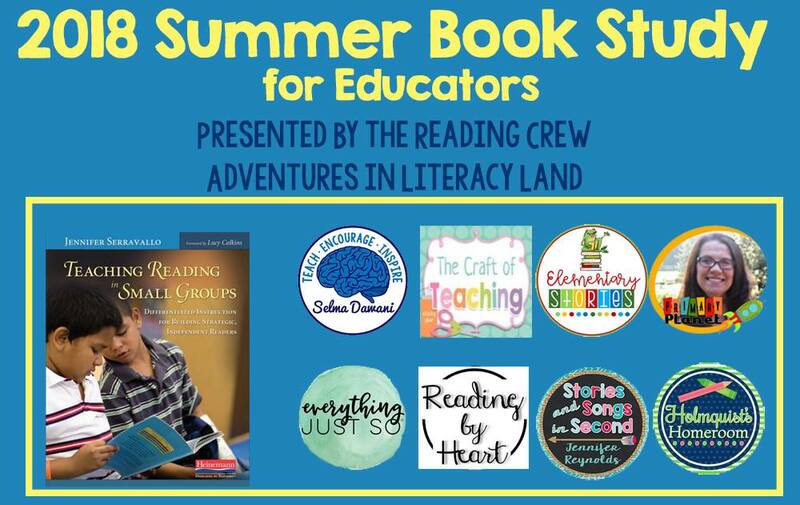 Also note that you can set goals during small group lessons if the opportunity arises! Make a chart with specific strategies/goals for each skill. I'm going to start collecting a list for myself to keep in the front of my binder. Then I can refer to it when I'm stuck. You could even do this as a team! If you're not sure where to start, it's okay to give everyone the same goal for a while. Don't stress yourself out! Good instruction is good instruction. 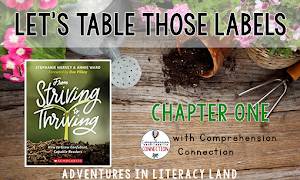 As you become more comfortable with these conferences and learn more about your students, it will be easier to branch out and give different goals. The more notes you take, the better you will know your students. 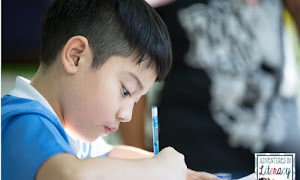 Any little note can help you recognize ways to help your student later. I like to make notes of the types of books they are drawn to as I work with them so I can help them find good books for them. 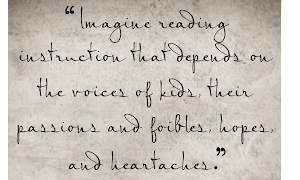 This also helps when I'm choosing books or passages for us to use as a class! I hope that some of these tips help with your own instruction!